The White Tree i Pristina, Kosovo: Bestill nå! 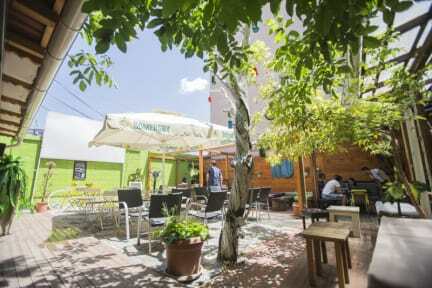 The best hostel in Prishtina? Drawing from our hostel experiences while traveling, we decided to bring together the best of what we saw internationally with the well-known local hospitality. After much deliberation, we rented a ramshackle space with a dead tree in the middle. We painted it white, added colorful twinkling jar lights and we gave a life to the White Tree! 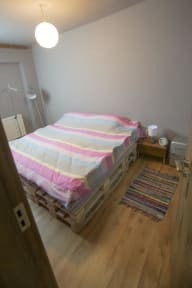 Two private rooms with a double bed and a private bathroom, a twin private room with bunk beds. Instead of a 12 room that we had we now offer two 4 bed rooms and a 6 bed room. Bunk beds, covered with fresh sheets, are made of steel, and mattresses are of the best quality! Clean towels are available for a symbolic price; meanwhile lockers are inside the rooms and ready to be used. Internet is basically a human right in Kosovo so that is not an issue in our hostel; free Wi-Fi for everyone! Although you will find cheap but mouthwatering tasty local food in Prishtina, we still don’t offer breakfast for our guests. Our staff is committed to offer a warm, homely and friendly atmosphere during your stay.